OverviewJr. Pac-Man is an arcade game released in 1983 by Bally Midway without Namco's permission. Jr. Pac-Man is son of Ms. Pac-Man and Pac-Man. This is the third or fouth gaming series of Pac-Man. The mazes are unigue and different after each set of conclusion of play. 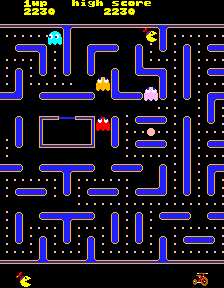 The screens scrolls horizontally and unlike Ms. and Mr Pac-Man, there are no escape tunnels. The mazes are harder but more fun than the original Pac-Man. There is a bouncing toy twice on the mazes separately that you must get without getting caught by the ghosts, Tim, Blinky, Pinky and Inky. However the bouncing toy changes the dots for bigger pellets after the toy goes thru them. Now you can add videos, screenshots, or other images (cover scans, disc scans, etc.) for Jr. Pac-Man (Pengo hardware) to Emuparadise. Do it now!